November 1984. Hohenschönhausen Detention Center. A prisoner is suspected of having helped a friend flee the country. State Security Captain Gerd Wiesler interrogates him efficiently and mercilessly, using an arsenal of means to pressure the man, including sleep deprivation. 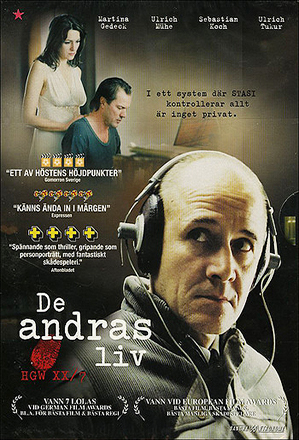 Wiesler has his interrogation tape-recorded for use as an example in the classes he teaches at the College of the State Security (Stasi). Lieutenant Colonel Anton Grubitz, a former classmate of Wiesler’s who now heads the Culture Department at the State Security, invites Wiesler to accompany him to the premiere of the new play by Georg Dreyman. Afterwards, at the premiere party, Hempf cannot seem to take his eyes off the attractive lead actress Christa-Maria Sieland, Dreyman’s girlfriend.